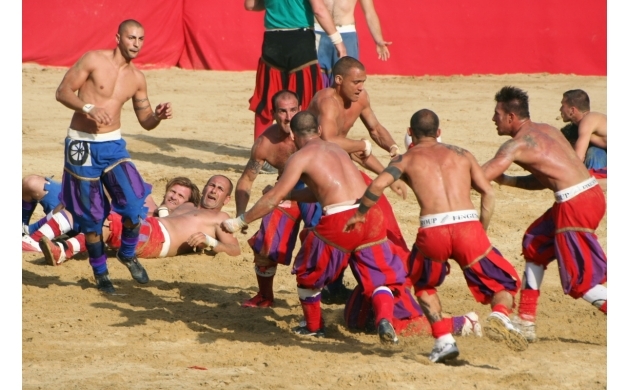 Considered by some to be the ancestor of the modern game of football, Calcio Storico (also known as 'calcio in costume' or 'calcio in livrea') dates all the way back to Renaissance times. 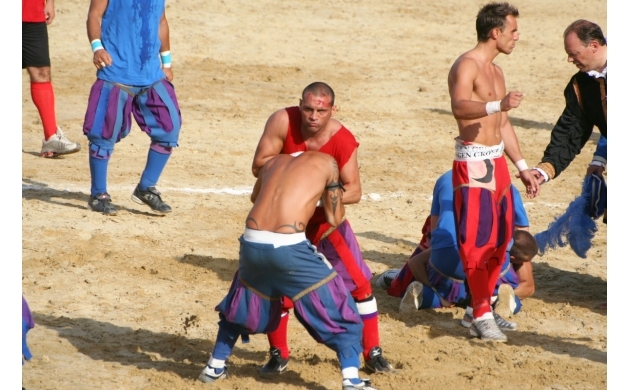 A rough pre-cursor to today's global sport, "Florentine Football" is a rougher affair, often devolving into massive brawls on the sand covered pitch erected every year in June in Piazza Santa Croce. The players during Renaissance times came from the four historic districts into which Florence was divided and where marked by four different colors - Santo Spirito (white), San Giovanni (green), Santa Maria Novella (red), and Santa Croce (blue). The participants were usually from the nobility, aged between 18 and 45, and wore brightly colored costumes. 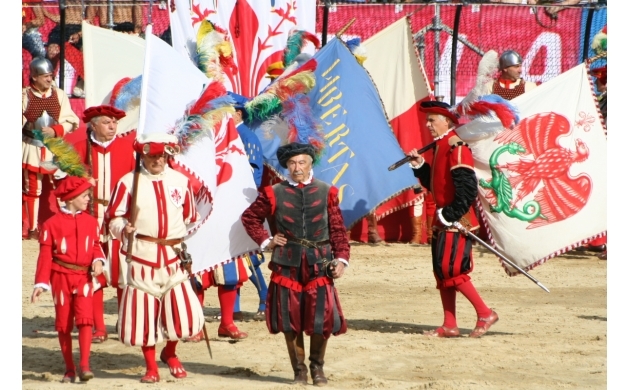 In fact, there have been many famous players of Calcio Storico including various members of the Medici family and even three popes (Clement VII, Leo XI and Urban VIII)! Teams of 27 players would battle for 50 minutes to see who could score the most points by getting a ball into the opposing team's net. There are very few rules (the game can best be described as a mix of football, rugby, boxing, and wrestling) - and can actually be quite brutal. The winner received a prized Chianina breed of cow. Over the course of history many memorable games would be played. In 1495 and 1605 the game was actually played on the frozen surface of the Arno river! In 1530 the game was still played despite the city being under siege from Papal troops (who reportedly watched the matches from the hilltops outside the city). In 1766 there was a match of Calcio Storico played in Livorno which was attended by the British consul - and it is said that what he saw resulted in the development of the modern game of football in England. The game slowly went on the decline in the 17th century, with the last game before the modern resurgence being played in 1739. It wasn't until 1930 and the 400th anniversary of the famous siege of the city that Calcio Storico was brought back to Florence to resume the ancient (and rather violent) tradition. Today there is an annual tournament in June played between the four historic squads, with the final taking place on the feast day of St. John the Baptist in front of 100,000 spectators crammed into a temporary stadium erected in Piazza Santa Croce. The game at one point became so violent that the tournaments in 2006 and 2007 were actually cancelled after a massive brawl broke out between the White and Blue teams during the semifinal match of 2006. 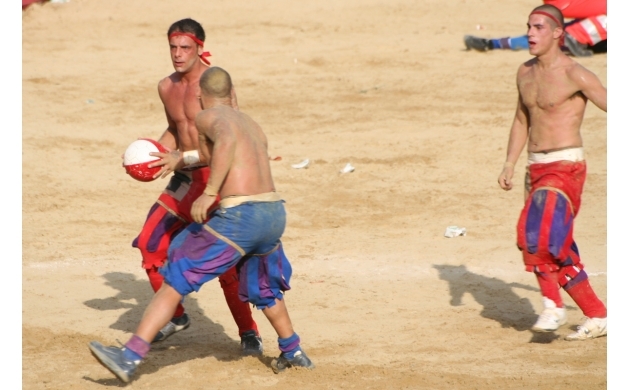 Luckily for fans of Calcio Storico, the game is back now - and involves a great spectacle in the city. 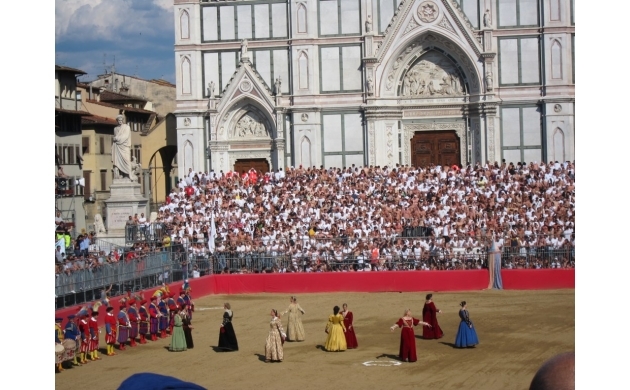 On June 24 at about 4pm there will be a parade in historical costume from Piazza Santa Maria Novella to Piazza Santa Croce, as the players make their way to the field for the 5pm final match. Tickets can be hard to find though, and usually cost between 22 and 53 euros. So it's best to act fast. It's a great way to experience some of the unique culture and history of Florence - and get a shot of adrenaline too! After the game, you can grab a gelato along the Arno river and watch the fireworks launched from Piazzale Michelangelo. The semifinals will be played on June 11 and 12, with the final match on June 24. Every game will be played in Piazza Santa Croce. Tickets can be purchased online at this link. Or you can go to any Boxoffice Toscana vending points to buy tickets in person.